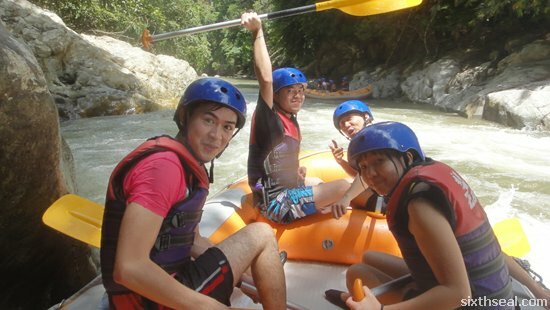 I had dinner with Jazz just now and recalled our white water rafting experience in Gopeng, Perak. 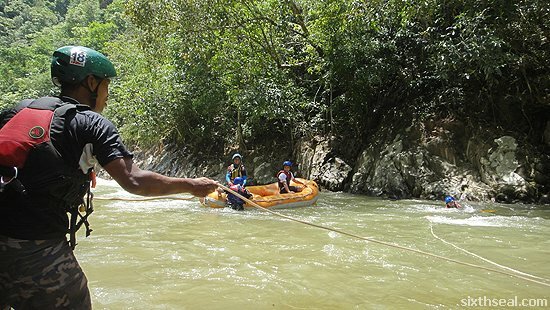 The stretch of Kampar River that we went on is rated as Grade 2, which is very basic compared to the Class 4 in Pelagus Rapids, Kapit (about an hour from my hometown) and sea kayaking in Australia that I experienced last year. 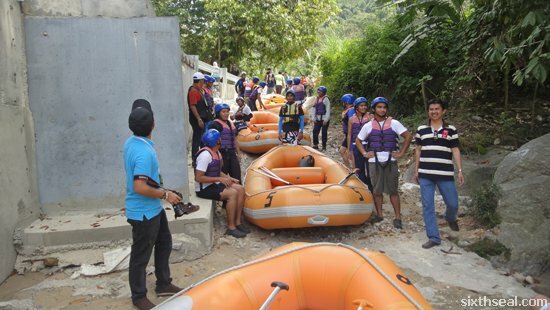 However, it’s always fun to go white water rafting regardless of the skill level. 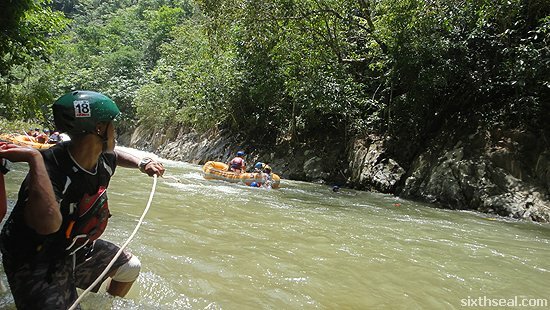 I’ve even gone tandem white water rafting with no raft, Jackass style. Heh. I’m amazed at how skinny I was back then. 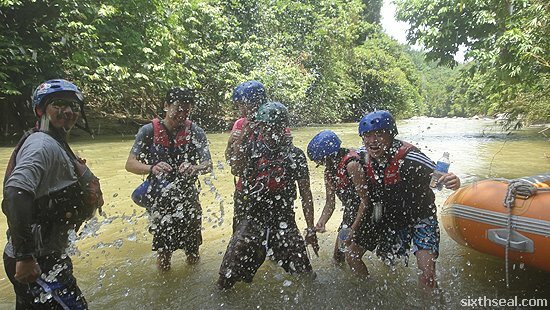 …an introduction to the feeling of being swept away by the rapids – all of us went off the first churning stretch feet first without a raft. You basically let the current take you down for about 100 meters while a guy at the end throws you a line with a flotation device to rope you back in. 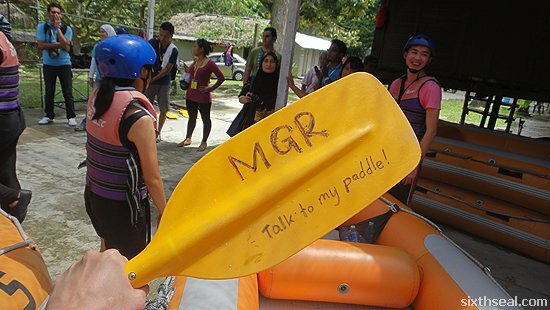 I thought that was a great idea to introduce new people to how being in the rapids feel like. I fell out of the raft once but managed to get back in without any help. 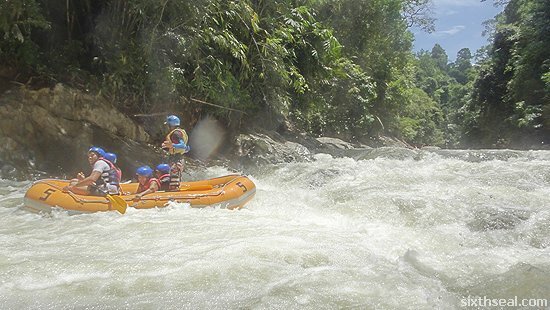 It’s a fun experience for all ages – you don’t even need to know how to swim (although that would be a plus) and if you go during the evening, I hear the rapids gets more intense. Anyway, halfway through the course, me and the instructor got out heads together to throw Jazz into the water coz she was holding on to the rope the entire time. 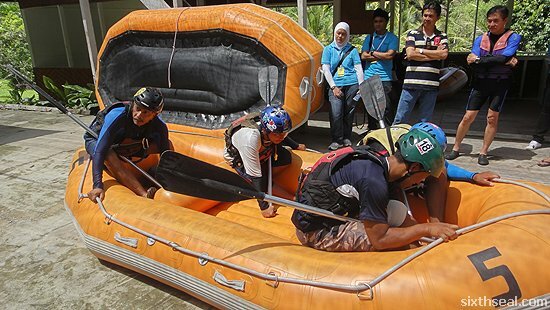 This effort was the reason I fell out of the raft myself as mentioned above – the plan called for him to signal me and we’ll both lean right to shift the center of gravity and flip the boat. Unfortunately, I confused right with left. I leaned left while the weight was to the right and promptly fell into the water. Haha! We did save someone who fell in and got swept away, but we did not get Jazz into the water except during two planned capsizes in totally calm waters so we can learn to set the raft upright and get back in. 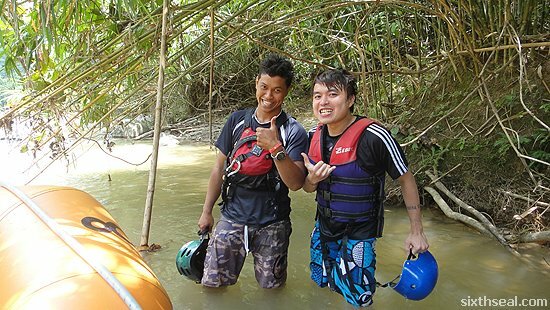 Lina of Kosmo interviewed me about the experience so if you can read BM, here’s the link – it translates to Challenging the Rapids at Kampar River. I think. My BM is quite rusty. 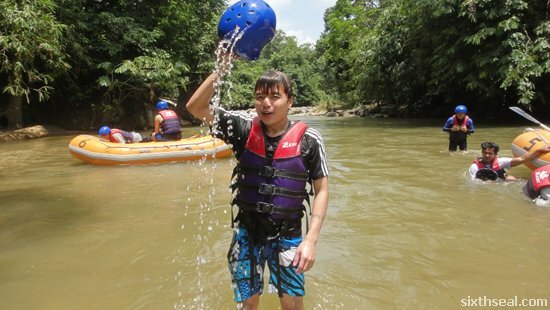 I love white water rafting in Kampar River, Gopeng. 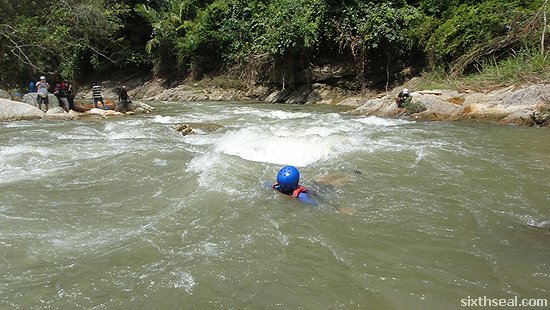 It was fun for me since I didn’t hunker down or hold on to the rope when we went over the rapids. Instead, I swung the paddle overhead while making appropriate whooping noises. 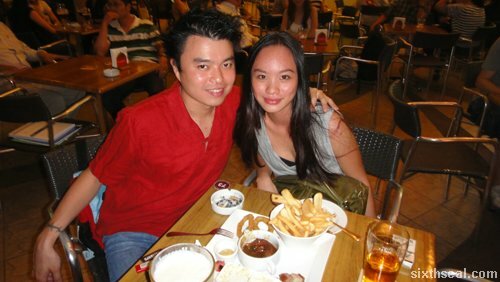 We were having drinks in Jaya One when I finally got around to around to asking her how we know each other. It turns out that we don’t. She reads my blog, added me on Facebook and it was a random and casual “Okay, let’s have drinks sometime” that led to this particular day. Bonnie turns out to be 22 (!!!) and she’s a student at Monash. She also acts part time in local productions. Anyway, it seems that we have something in common so we were just talking and suddenly I thought about going on a road trip. 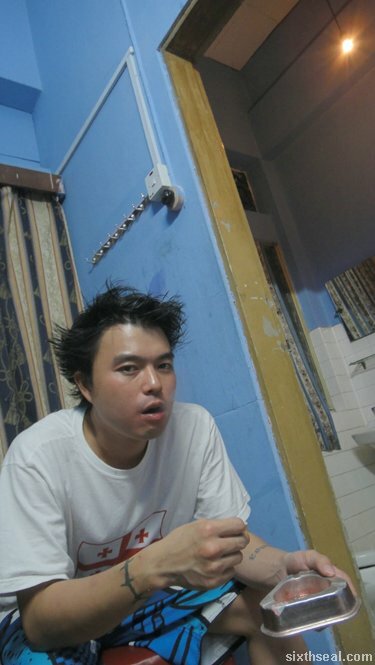 It was 12 am at the time and the plan was to head down to Ipoh for the dim sum. 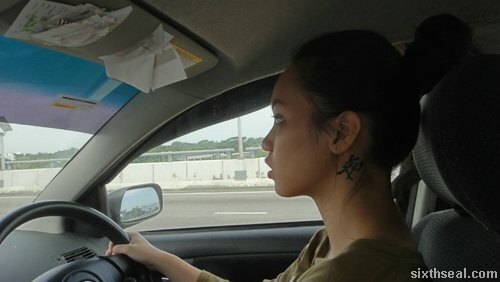 I’ll follow her car back, pick her up, and then head down to Ipoh and stay the night at a hotel before waking up for breakfast. The first thing that went wrong was losing my wallet. I think what happened is that I took it out and used my credit card to pump gas. I remember leaving the wallet on the boot of the car and taking the receipt but I did not remember taking the wallet back into the car. I suspect my wallet was still on the boot when I drove off. FML. I had about 1-2k inside but what’s worse is the MyKad, driver’s license (!!!) and credit cards which I have to replace. 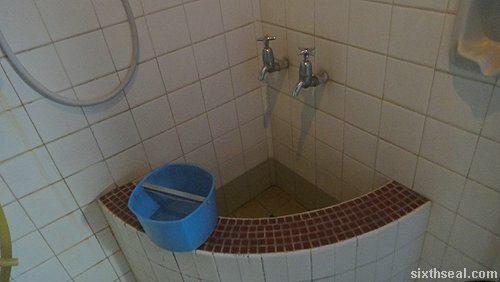 I only realized it when I got to Ipoh coz when it came to the toll, Bonnie paid for it but I was puzzled as to where my wallet was – it was supposed to be on the dashboard. However, after a prolonged search when we arrived there, it was nowhere to be found. 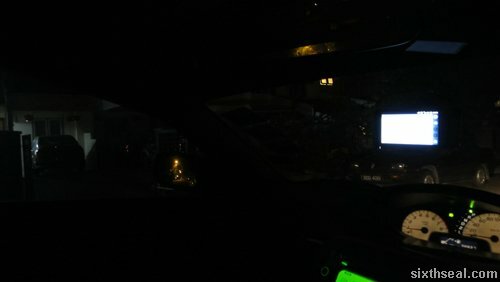 My car can be a black hole sometimes, but it’s still a confined space so after looking into every nook and cranny, the most plausible explaination is that I left it on the boot and drove off. Naturally, without any money, Bonnie had to withdraw from an ATM and we went in search of a hotel. She also took over the driving. I think we went to 5-6 hotels but all of them were full. It was insane! There’s apparently some kind of military function going on there and it was about 5 am when we finally drove up to this dodgy looking place called Shanghai Hotel. This is what the hotel room looks like. Anyway, my pillow had this really weird smell to it so I shared Bonnie’s pillow and we slept, fulling intending to wake up at 8 am in the morning. It was 11 am when I woke up. 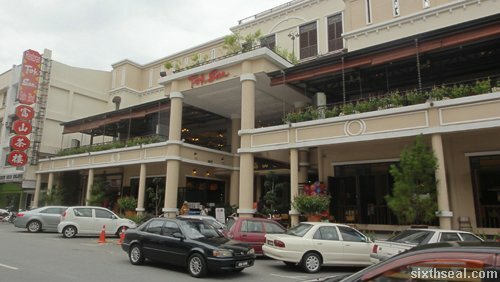 This is what we were down in Ipoh for. Bonnie swears by the lam mei pau. 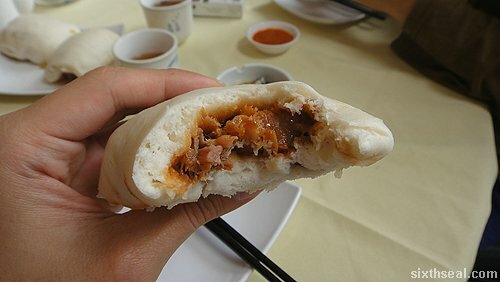 It’s a bun that’s filled with fatty pork and it’s absolutely fabulous. It was well worth the drive down. We also had some other stuff – my usual har kao (prawn dumplings) and a memorable dim sum made with juicy succulent prawns and salted egg yolk. 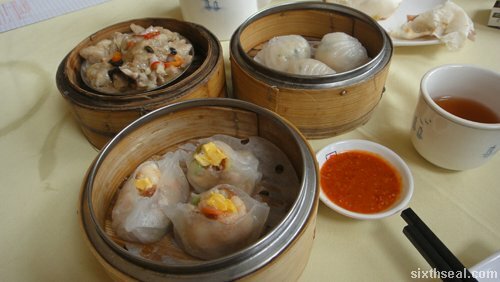 However, the lam mei pau was every bit as good as Bonnie said it was. We were afraid we’ve missed it but apparently even though the dim sim place tells you it’s no longer available, you can get it by going to the take away counter and ordering it. Try it, and thank Bonnie (or rather, her mom) if it works. We even got a box to tapau back home. 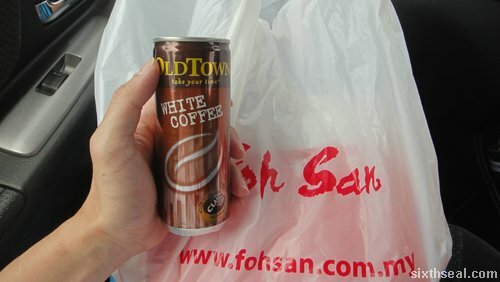 Caption: Why drink canned Ipoh white coffee in Ipoh? 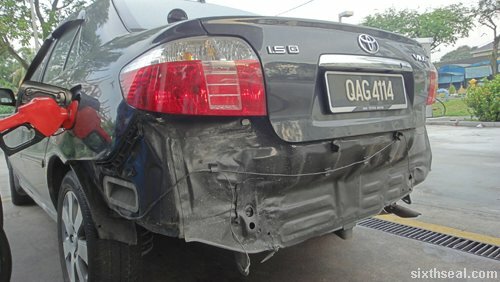 Oh, and I also lost my rear bumper somewhere during the drive to Ipoh. It’s not an epic weekend unless you’ve lost a car bumper, your wallet and all the identification in it, slept in a dodgy hotel and sped back to KL…and the weekend is still not over. Bonnie crashed at my place last night and helped me out with something I had to get done during the weekend. I know it sounds like a tragic weekend, but it’s really an awesome one. Seriously, it’s not a havoc weekend unless you’ve lost something and now I’m driving with no driver’s license, MyKad and with a missing bumper. Cop magnet much? This illegal PRC immigrant says yes. I’ve been diligently avoiding roadblocks so let’s hope I can keep up with that until Monday.